Happy almost Monday you beautiful badass bakers! Now, I know what you’re thinking. “Happy almost Monday?” Sounds like the oxymoron to end all oxymorons what with “happy” and “Monday” being so close together and all. 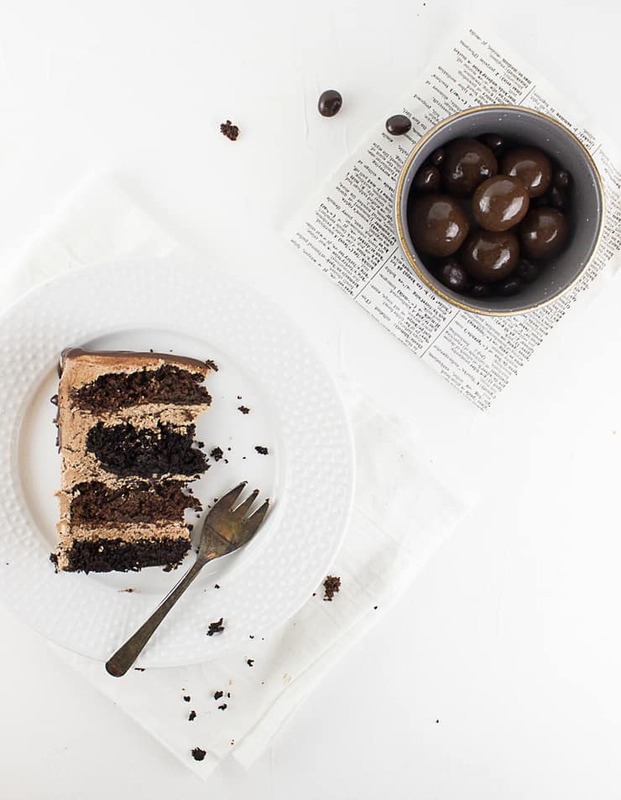 But when a Monday involves copious amounts of chocolaty cake goodness, I’m pretty sure it qualifies as a “good” Monday. 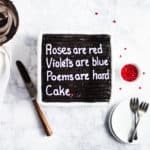 About a month ago I asked my husband what kind of cake he wanted for his birthday, which resulted in a week long deluge of daily updates on potential cake flavors. He ran the gambit of flavors… everything from fruity to sweet and syrupy and ever possible flavor in between. But one day he came to me, a determined look on his face and requested a chocolate cake. I know, he might have a slight flair for the dramatic but we can just add “food-related dramatic flair” to the long list of the many reasons I love him. 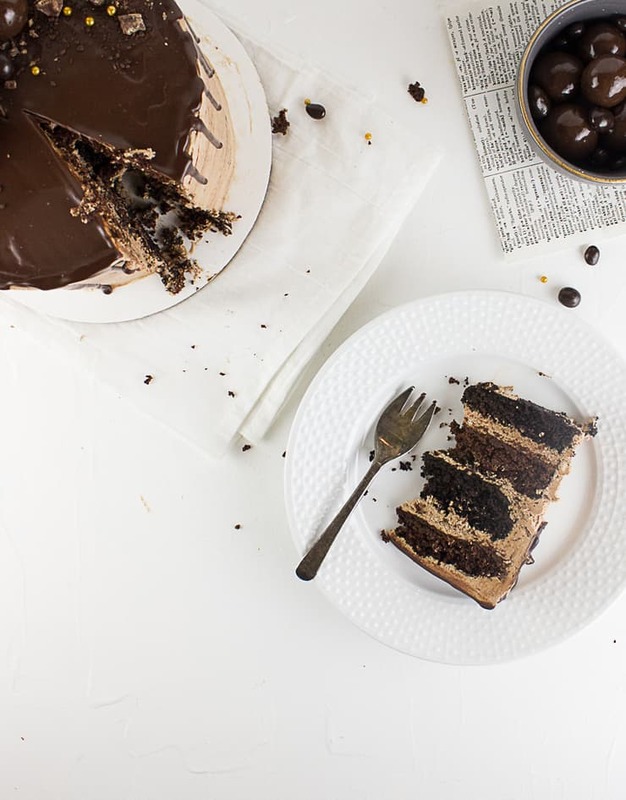 So, chocolate cake to end all chocolate cakes? CHALLENGE ACCEPTED. 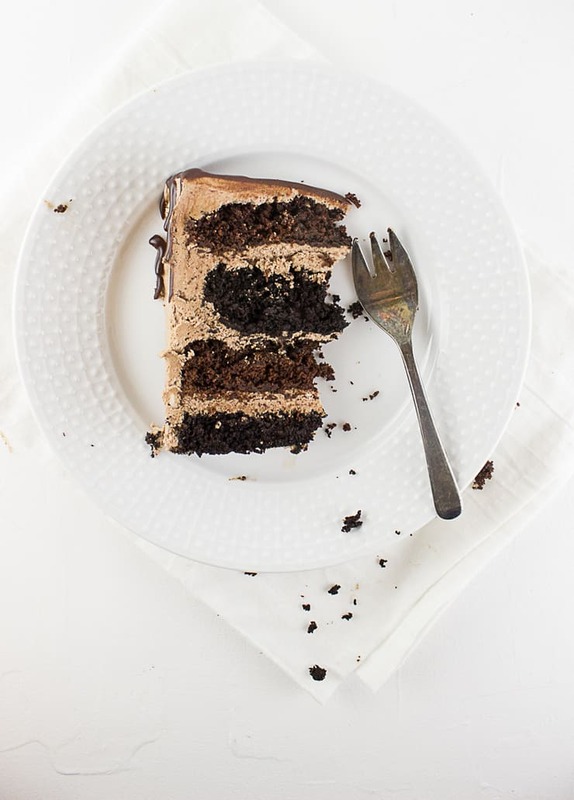 I see your chocolate cake… And raise you chocolate italian meringue buttercream frosting, coarsely chopped crunch bars between the layers, a dark chocolate ganache drip, and more chocolate candies than your stomach can handle! I’m not going to say this chocolate cake has too much chocolate, but let’s just say we couldn’t fit anymore chocolate into it! 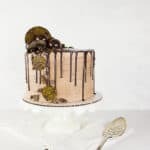 With 4 layers of chocolate cake, chocolate frosting and a rich chocolate ganache drip, this cake is a chocolate lovers dream! To make the cake, pour the boiling water over the chocolate chips, and whisk until smooth. In the bowl of a stand mixer, whip the eggs until light and frothy. Add the vegetable oil and continue whipping until completely incorporated. Add the sugar, buttermilk, and water/chocolate mixtures, and whisk until just combined. Gently fold in the flour, baking soda, and baking powder with a spatula until the batter is lump free. Divide the batter evenly between two bowls. Fold 2 oz special dark chocolate baking cocoa to one, and 2 oz regular baking cocoa to the other. Divide the came batter evenly between four 6″ cake pans (if you have a kitchen scale, it’s about 1lb cake batter per pan), and bake at 350F for 30-35 minutes, or until a toothpick inserted into the center of the cakes comes out clean. Once the pans are cool enough to handle, transfer the cakes to plastic wrap, and refrigerate until cool and firm. To make the frosting, stir together the water and granulated sugar in a small saucepan over medium-high heat. Boil until completely clear. While the syrup boils, whip the egg whites in a stand mixer until stiff. With the mixer on high, slowly pour the hot syrup down the side of your bowl and into the egg whites. Whip until the mixture and bowl cool to room temperature. With the mixer on low again, add pieces of butter until all the butter has been added. Add the vanilla extract. Increase the speed to high and whip until a smooth frosting forms. Melt the 12 oz chocolate chips and gently fold the chocolate into the frosting. Once the cakes are cool, level the tops if necessary. Using the frosting, begin stacking your layers of cake and filling between the layers. 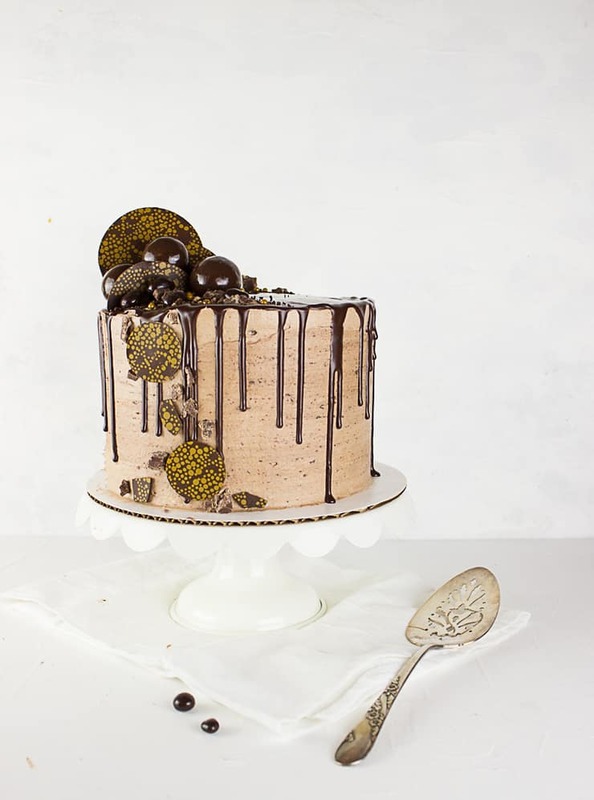 If you want to make your cake extra decadent, add some coarsely chopped chocolate candy between your layers. 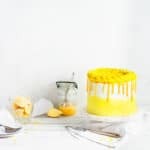 Coat the top and sides of the cake with a thin layer of frosting (a crumb coat) and allow to set in the refrigerator (about 15 minutes, or until the frosting is firm). 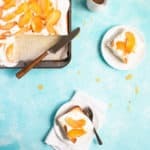 Frost the top and sides of the cake with a generous helping of frosting, smoothing the frosting with an offset spatula or bench scraper. Melt the remaining 1 oz of chocolate chips and add dollops here and there to the frosting to create some contrast with the rest of the frosting. Smooth with an offset spatula or bench scraper. Allow to set in the refrigerator until the frosting is firm (about 15-20 minutes). Top with an assortment of chopped and whole chocolates. Wow! This looks incredible! A slice of this with a cup of coffee…..YUM! Wow! 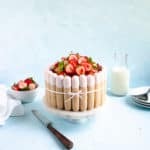 This cake is a showstopper! Mmmm chocolate cake! Looks almost too gorgeous to eat! Hey what temp am i meant to bake this. Am i crazy for not seeing that crucial step? This looks amazing. I’m going to try it! I don’t have 6” pans. Can I use two 8”? Hi Michele! Great question! You can absolutely use two 8″ pans and I would start by checking it around the 30 minute mark since it should be roughly the same thickness as the four 6″ cakes. Mathematically speaking, an 8″ cake pan has roughly 1.78x the area of a 6″ cake pan, so if you wanted to get an equally tall cake, you could also double the recipe.